Not long ago I received a package of CDs from a collector of import metal. In it were several bands from countries not known for their metal bands, most of which sing in their native languages. 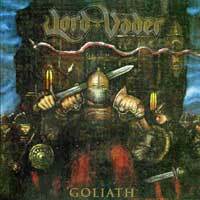 Lord Vader from Polan are one such band. Musically they are classic, traditional heavy metal reminding me slightly of Accept at times, with a singer that sounds like a young Udo spitting out lyrics in Polish. Oddly enough, the song titles themselves are in English. While this CD compilation was release in '01, most of the songs themselves were recorded in the early 1980's when Poland were still behind the Iron Curtain, which is certainly amazing in itself. Surprisingly the production isn't bad at all. Of course it won't hold up to the standards of the current crop of power and progressive metal bands, but for those who enjoy that classic, 1980's metal sound, the production and song writing is quite good. Tracks 1-8 were recorded in 1986, tracks 9-13 were recorded in 1983, and tracks 14-16 were recorded in 2001, although the songs were written in 1987 and were previously unreleased. Rerecorded and Released again in 2001 by Karthago Records with liner notes written by Bart Gabriel.